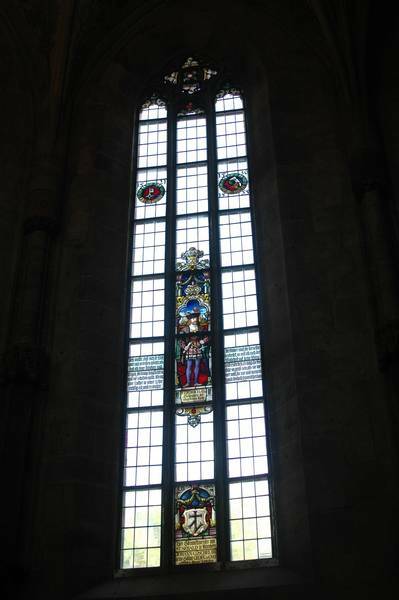 The six large choir-loft windows were conserved by us in 2004 and equipped with a contemporary, interior-ventilated exterior protective glazing. 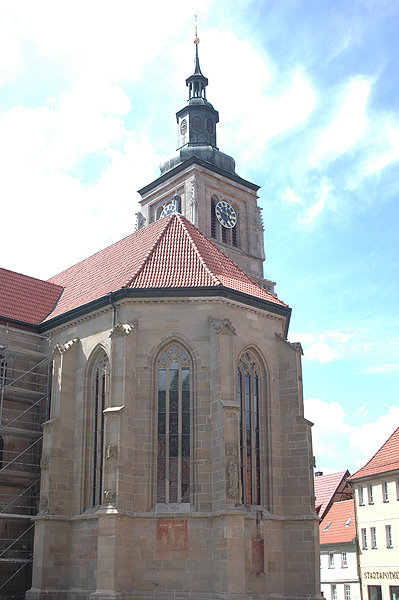 The Town Hall and the local parish church (the Marienkirche has been Lutheran since 1523) are located next to each other. On the enormous foundations of a profane building, the first fortress at Königsberg, the people of Königsberg wanted to erect a cathedral in the late 14th century. 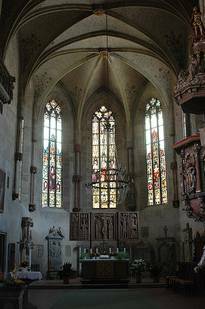 Indeed, it became one of the most presentable Gothic parish churches in all of Franconia. 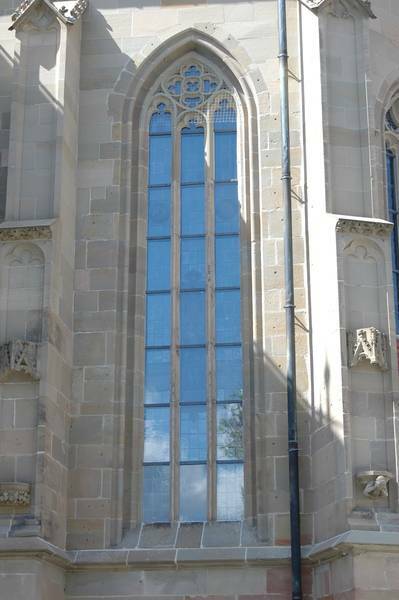 Its tower extends 46 m skyward- and it seems as if the masters of the Strassburg builders' lodge had lent to the steeple a slightly French stylistic accent. 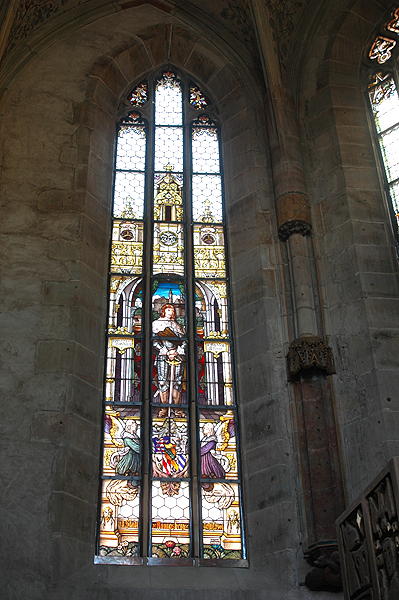 The construction of this church began in 1397. A long period of construction followed. For instance, the steeple could only be finished after its consecration in 1432 (14 years later, in 1446). 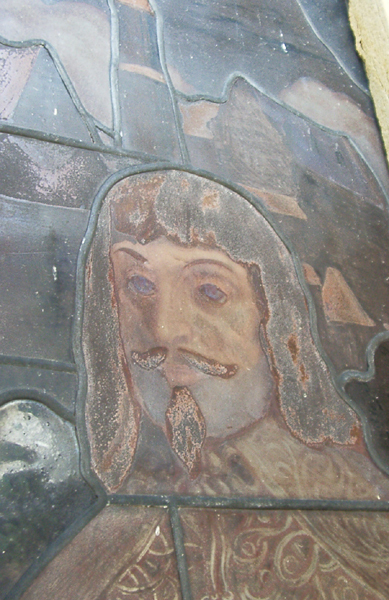 A fire in 1640 destroyed many details. 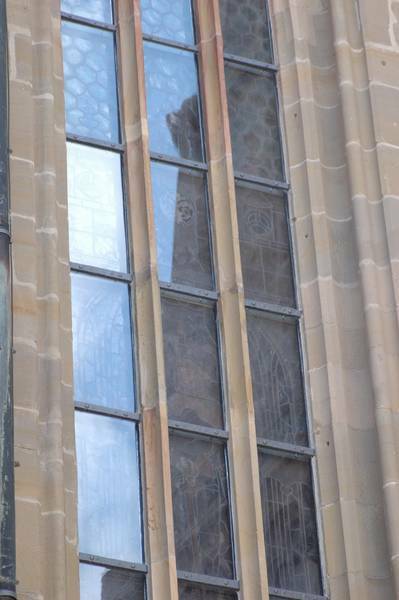 On the buttresses at the eastern side of the choir loft, we see – as the only one of the figures formerly displayed there – a Madonna. However, this is a mere re-creation of the valuable original from approx. 1420 (kept at the Veste Coburg). Under the image of Mary, there is one of the typical consoles, metaphorical images of human vices (greed, foolishness, uncouthness). Somewhat below that, on a fresco (which, unfortunately, has meanwhile faded), the martyrdom of St. Sebastian is displayed. Whoever enters this church will be impressed by the pitched columns and archways which transverse the three naves and the choir-loft area. 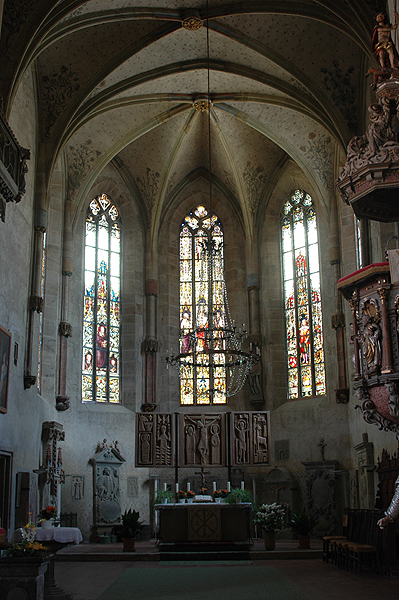 Where the interior furnishings are concerned, the following are remarkable: a Renaissance console, connected in 1697 by low choir screens with the pulpit supported by a figure of Moses. 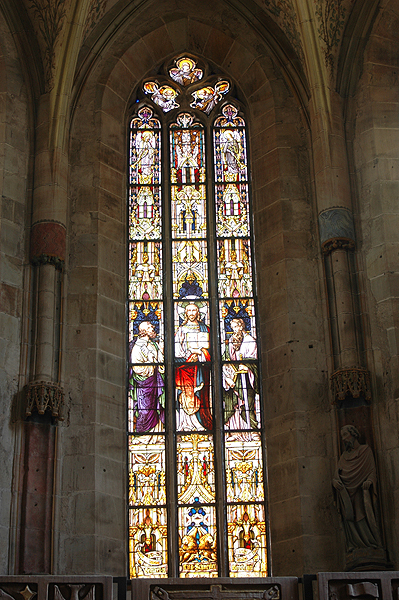 In the archway blinds of the Baroque pulpit, the four Evangelists are depicted along with Christ. 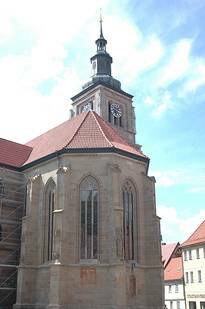 In 1432, on the feast day of St. Kilian, a commissioner employed by the bishop of Würzburg, had consecrated the church following a construction period which had spanned 70 years. 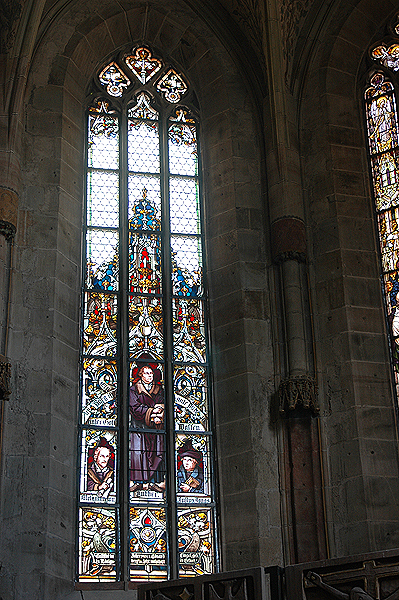 It remained Catholic for 92 more years, until the people of Königsberg resolved to become Lutheran in 1524. During the Thirty Years' War, the general Tilly occupied the city of Königsberg. 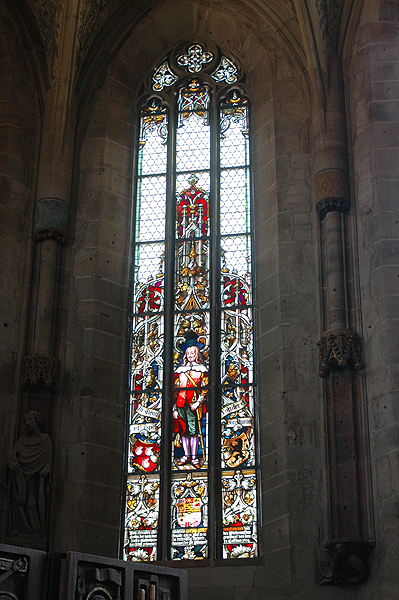 Due to his influence, the Marienkirche remained unscathed by the Great Fire of Königsberg in 1632. Then, in 1640, local arsonists struck. They plundered the church and set it afire. Only the foundation walls remained standingen. 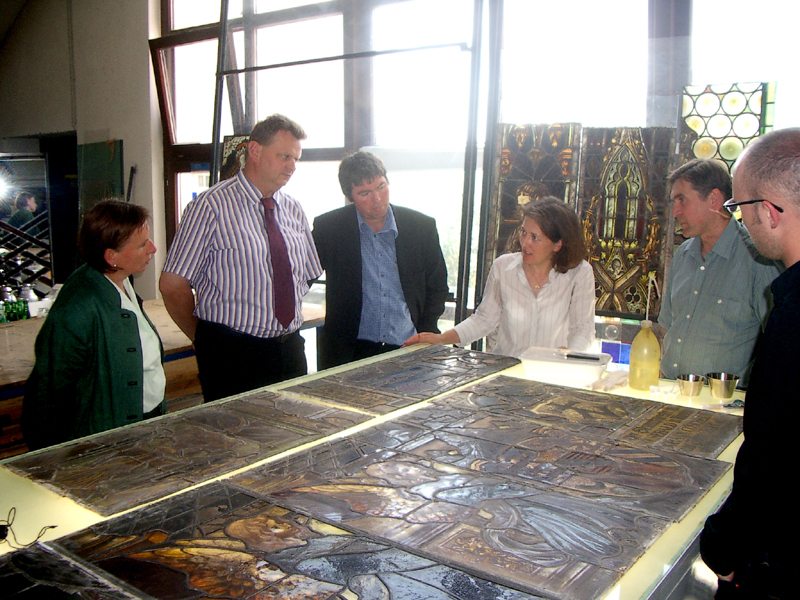 Five years later, the people of Königsberg began to perform crude corrective maintenance on the church. 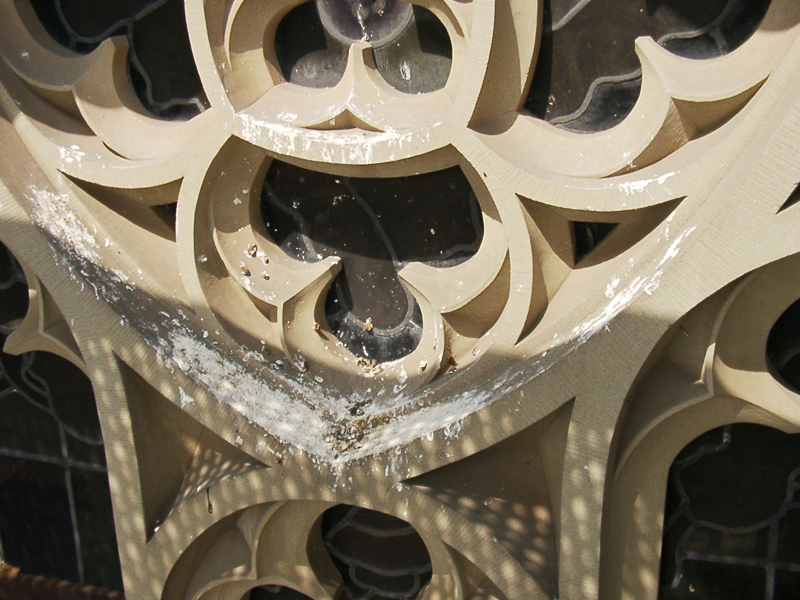 It was left in this condition for several centuries. Then, in 1897, the question at hand was: build a new church or restore the old building from the foundation upward? 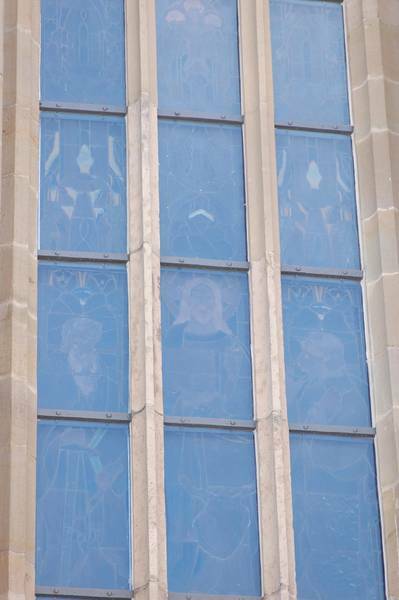 The choir-loft windows are typical exemplars of glass painting ii 1900 and with portrayals of figures in front of landscapes and/or architectural elements. 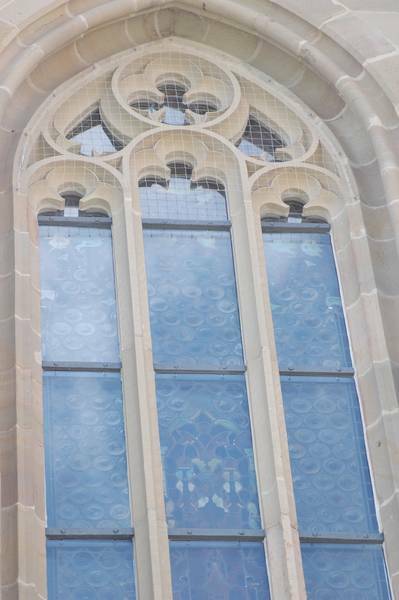 The window at the choir-loft crown is designed across its entire surface with glass painting. 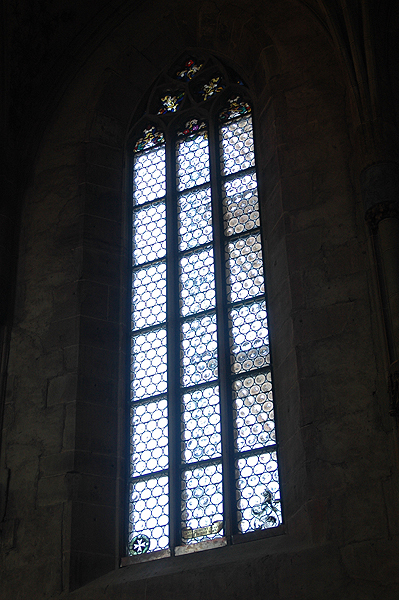 All other choir-loft windows display fields or at least partial surface in flash, hexagonal or rectangular arrangement. Here, too, it was important for us to jointly develop a good conservation concept by way of comprehensive meetings with the principal and the State Office for Monument Conservation.